Mid-18th century French tan calf gilt, spine in compartments profusely gilt, red morocco title label gilt, marbled paper endleaves, vellum flyleaf, red edges. Melvin R. Seiden Collection, 2006. Remained in France at least until the late eighteenth century; bookplate of F. Gaudy, perhaps the German poet Franz von Gaudy (1800-1840); sale (London, Sotheby's December 3, 2002, lot. 1). 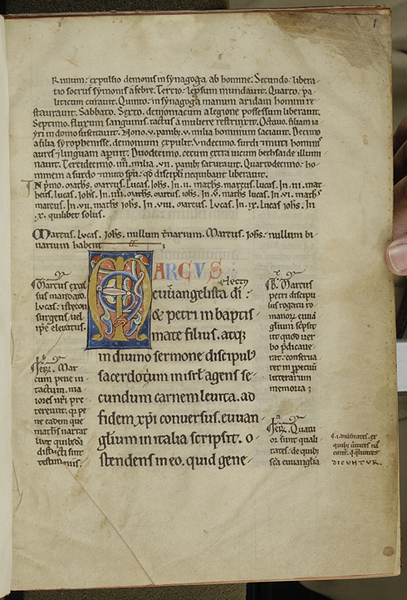 Ms. selections from the Bible, glossed, written and illuminated in Northern France, probably in Paris, ca. 1170-1180. Decoration: 4 large illuminated initials, of which 3 are inhabited; 2 large divided initials; painted and penwork initials throughout. Texts: Prologue to the Gospel of St. Mark; Gospel of St. Mark, glossed (fols. 3r-85r); Prologue to the Canonical Epistles (fol. 86r); Canonical Epistles, glossed (fols. 86v-140r), including: James (fol. 86v), I Peter (fol. 99v), II Peter (fol. 112v), I John (fol. 120v), II John (fol. 132r), III John (fol. 134v), Jude (fol. 136r). Scribe: close to the hand of the glossed books made in Paris around 1180 for Master Robert of Adington--Cf. R. Mynors, Durham Cathedral Manuscripts, 1939, 78-82, pl. 48. Collation: i-xi8, xi5 [of 6, blank vi cancelled], xii-xvii8, xviii7 [of 8, blank viii cancelled], with some catchwords (referring to the Gloss) and some numerical signatures in two sequences beginning again from the start of the Epistles.